Working in manufacturing plants, the Director of Quality Assurance ensures that the goods produced to comply with the standard industry rules and regulations. 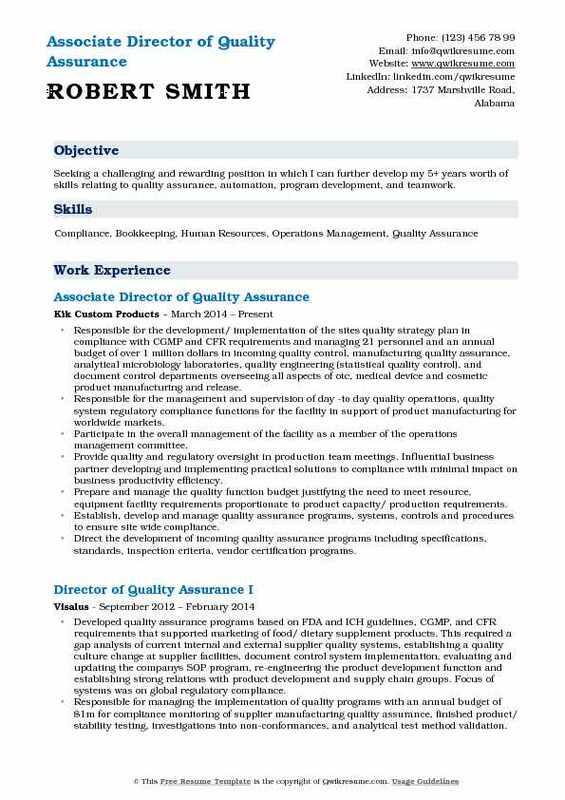 The Director of Quality Assurance resume mentions highlighting duties such as – running quality assurance control programs, testing products, recruiting and hiring QA staff, identifying control nodes, documenting defects, preparing annual budgets, monitoring all operations, reporting on malfunctions, ensuring immediate action, making on-site inspections and appraising customer requirements. 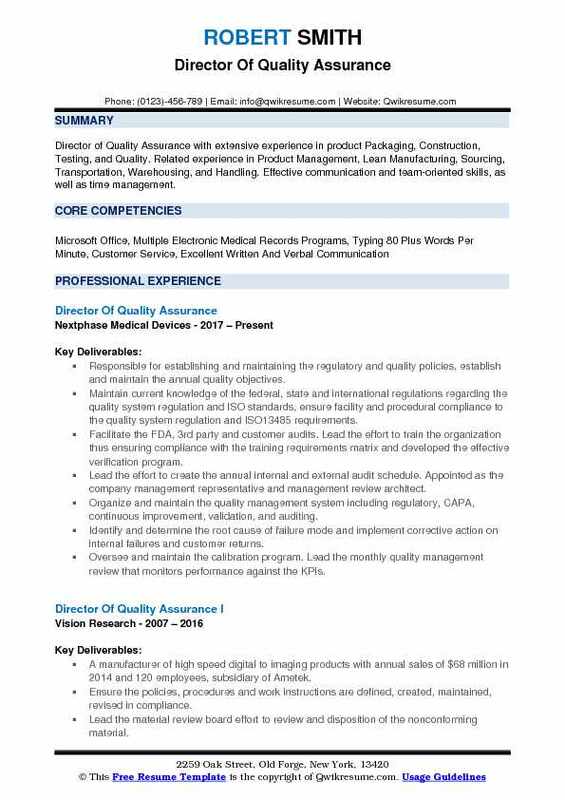 Those interested in this line of operation should mention in the resume skills such as – quality assurance expertise, a thorough knowledge of quality assurance standards, good knowledge of MS Office and databases, quality focus and a result-oriented approach. Quality assurance directors should possess to the least, a degree in engineering related field. 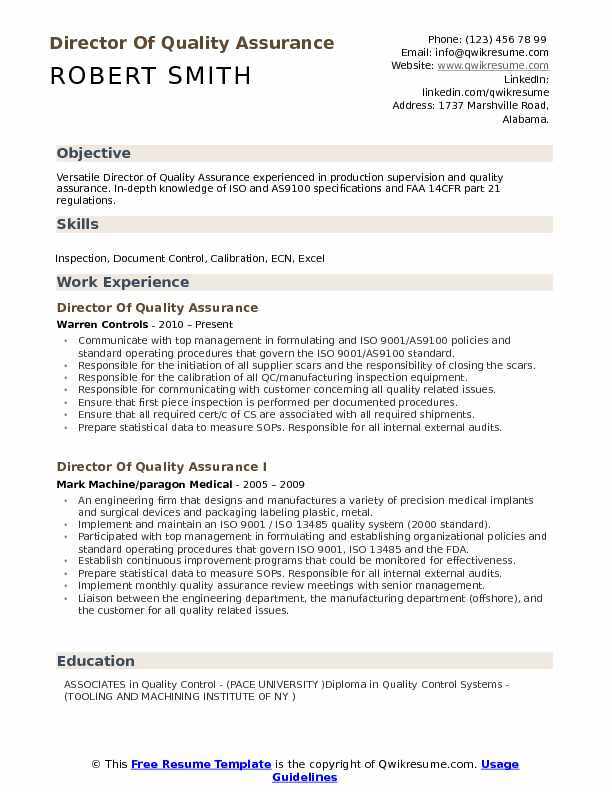 Summary : Versatile Director of Quality Assurance experienced in production supervision and quality assurance. In-depth knowledge of ISO and AS9100 specifications and FAA 14CFR part 21 regulations. Communicate with top management in formulating and ISO 9001/AS9100 policies and standard operating procedures that govern the ISO 9001/AS9100 standard. Responsible for the initiation of all supplier scars and the responsibility of closing the scars. Responsible for the calibration of all QC/manufacturing inspection equipment. Responsible for communicating with customer concerning all quality related issues. Ensure that first piece inspection is performed per documented procedures. Ensure that all required cert/c of CS are associated with all required shipments. Prepare statistical data to measure SOPs. Responsible for all internal external audits. Implement monthly quality assurance review meetings with senior management. Liaison between the engineering department, the manufacturing department (offshore), and the customer for all quality related issues. Summary : Director of Quality Assurance with extensive experience in product Packaging, Construction, Testing, and Quality. Related experience in Product Management, Lean Manufacturing, Sourcing, Transportation, Warehousing, and Handling. Effective communication and team-oriented skills, as well as time management. Responsible for establishing and maintaining the regulatory and quality policies, establish and maintain the annual quality objectives. Maintain current knowledge of the federal, state and international regulations regarding the quality system regulation and ISO standards, ensure facility and procedural compliance to the quality system regulation and ISO:13485 requirements. Facilitate the FDA, 3rd party and customer audits. Lead the effort to train the organization thus ensuring compliance with the training requirements matrix and developed the effective verification program. Lead the effort to create the annual internal and external audit schedule. Appointed as the company management representative and management review architect. Organize and maintain the quality management system including regulatory, CAPA, continuous improvement, validation, and auditing. Identify and determine the root cause of failure mode and implement corrective action on internal failures and customer returns. Oversee and maintain the calibration program. Lead the monthly quality management review that monitors performance against the KPIs. 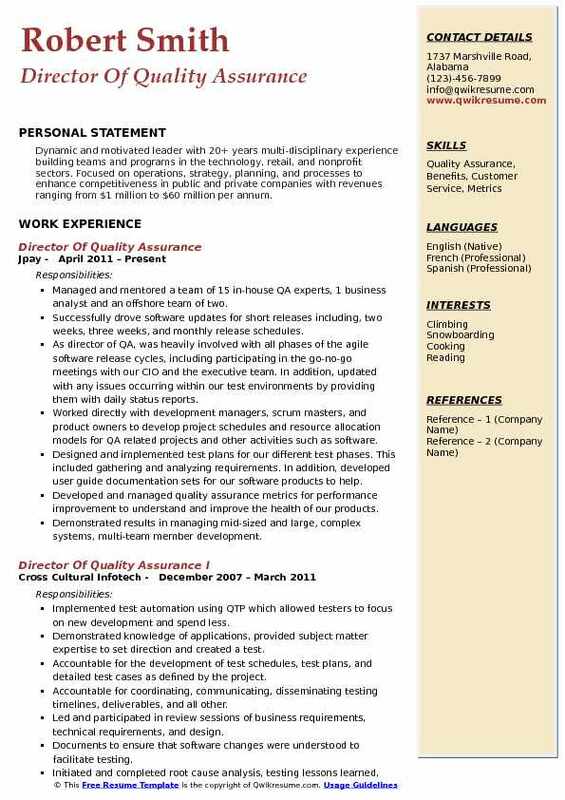 Objective : 10+ years experience in the QA/QC industry. Strong record/document review, preparation, and validation skills. Certified Quality Auditor as well as Lean Six Sigma Black Belt Certified. Familiar with various internal and external auditing techniques. Knowledge of FDA and FSMA requirements. Providing leadership in the development of an employee-oriented agency culture that emphasizes quality, continuous improvement, and high performance. Assisting in performing all tasks necessary to achieve the agency's goals and mission. Mentoring and developing a quality assurance team, managing work allocations, training, problem resolution, performance evaluations, and the building of an effective team dynamic. Ensuring record systems are maintained in accordance with regulatory and reimbursement requirements. Ensuring effective internal controls are in place to assure compliance with applicable regulatory agencies. Interpreting, implementing, and evaluating quality assurance standards. Devising sampling procedures and directions for recording and reporting of quality data. Planning, conducting, monitoring, and documenting internal audits and other quality assurance activities. Analyzing data to identify areas of improvement in the quality system. 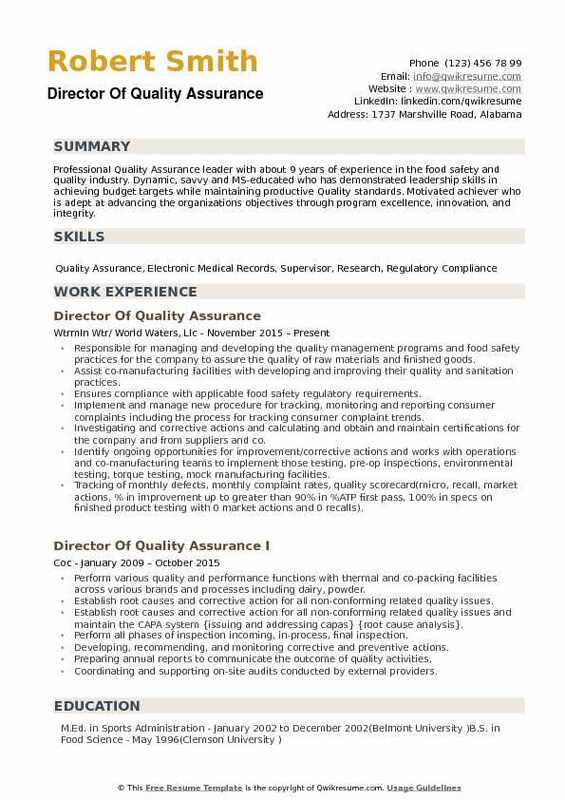 Summary : A quality assurance director position in a food company that will utilize my experience and skills to meet the companys quality assurance objectives and support my commitment to employee development and continuous improvement. Oversaw the development, implementation, and maintenance of an SQF level iii seafood HACCP corporate program and the quality assurance program for 7 entities nationwide. Led from a 24/7 perspective the programs required to produce safe, quality products. Managed 9 quality assurance managers and 22 quality assurance inspectors nationwide. Upheld the sanitation programs of 7 entities and maintained direct supervision of 17 sanitation personnel. Primary contact with regulatory (FDA/USDA), GFSI, and customer auditors. Responsible for process improvement, resolution of food quality/safety issues, and addressed all process and facility issues. Headed the vendor management program for over 500 suppliers; tracked quality and the cost of quality failure. Summary : As Director of Quality Assurance delivered quality results to the company without compromising my company's outstanding quality history. Have a strong industrial background that consists of a combination of years of industrial education and experience. Background ranges from experience with instrumentation/process technology to quality assurance. Responsible for streamlining the quality assurance process in the company by creating and executing suitable best processes and guidelines for the creation of test plans and cases providing thorough coverage to business requirements and functional specifications. Involved in technical meetings with development and business to evolve the right testing strategies with the underlying focus on assessing high-risk areas of the application. Guided QA team to focus on high-quality bugs and core business functionality issues. Ensure timely and quality deliverables for projects with tight deadlines and rapidly changing requirements. As being the first QA team member orchestrated the QA team, trained new resources to get them up to speed to make a quality contribution without comprising on the testing efforts by bridging the gap of providing extra support for testing on areas that involve complex workflows and functions. Select and prioritize functionalities for test automation by reviewing requirements specifications and expected level of usage. Provide an estimated testing level of efforts, duration, and dependence in support of project planning, capacity planning, and scheduling. Responsible for managing and leading offshore and onshore software quality teams. Member of interview panels involved in recruitments for executive level positions. Headline : Seeking a challenging and rewarding position in which I can further develop my 5+ years worth of skills relating to quality assurance, automation, program development, and teamwork. Responsible for the development/ implementation of the sites quality strategy plan in compliance with CGMP and CFR requirements and managing 21 personnel and an annual budget of over 1 million dollars in incoming quality control, manufacturing quality assurance, analytical microbiology laboratories, quality engineering (statistical quality control), and document control departments overseeing all aspects of otc, medical device and cosmetic product manufacturing and release. Responsible for the management and supervision of day -to day quality operations, quality system regulatory compliance functions for the facility in support of product manufacturing for worldwide markets. Participate in the overall management of the facility as a member of the operations management committee. Provide quality and regulatory oversight in production team meetings. Influential business partner developing and implementing practical solutions to compliance with minimal impact on business productivity efficiency. Prepare and manage the quality function budget justifying the need to meet resource, equipment facility requirements proportionate to product capacity/ production requirements. Establish, develop and manage quality assurance programs, systems, controls and procedures to ensure site wide compliance. Direct the development of incoming quality assurance programs including specifications, standards, inspection criteria, vendor certification programs. Oversee quality operations activities; incoming quality control, production process control, quality engineering ensuring process validation and verification compliance, review of deviations/ investigation and escalation of quality issues to address the root cause and implement corrective and preventative actions. Collaborate with the operations team to identify process improvement opportunities. Drive continuous quality improvements throughout the plant / lead a cross-functional team (production/ compounding/ rd) to conduct root cause analysis and implement process improvements to reduce or eliminate repeat quality incidents. 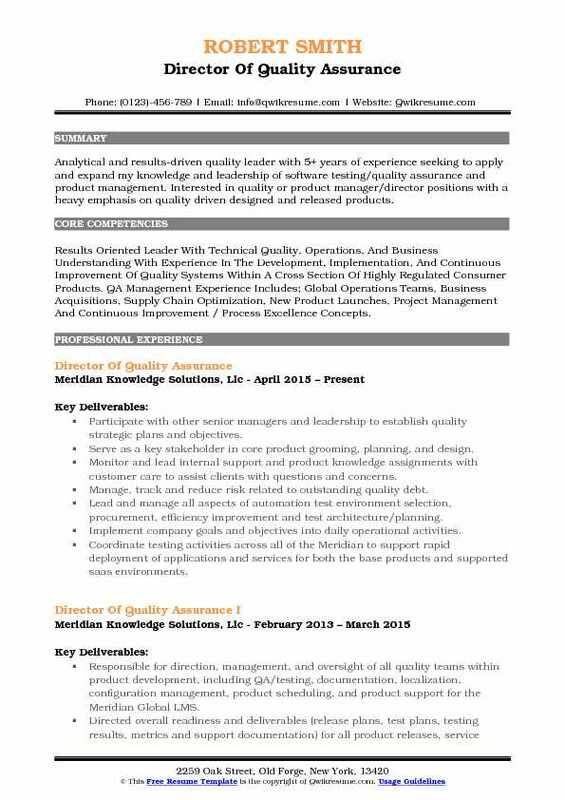 Summary : Over 16 years experience as a Software Quality Assurance Professional with 10 years in Leadership role. 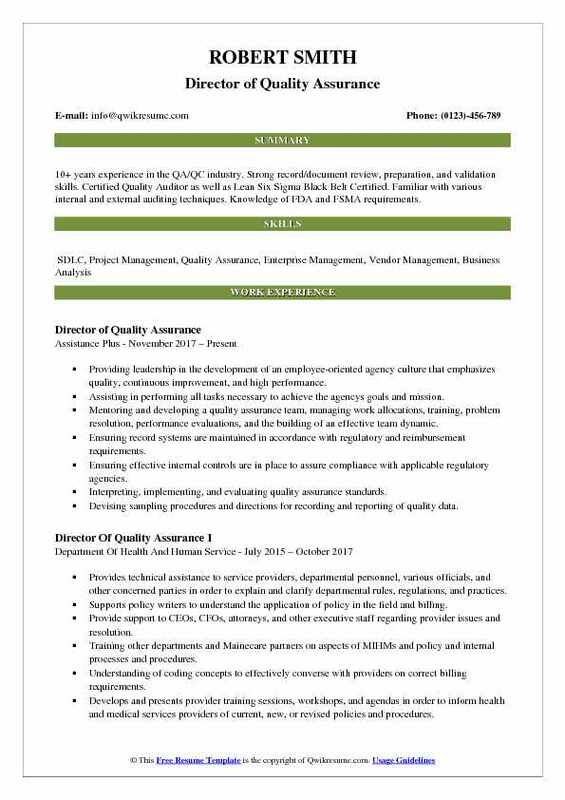 Proven Software Quality Assurance Director in managing globally-distributed teams engaged in scalable quality assurance and software testing for software development; uniquely qualified to collaborate with the engineering team, leveraging skills in both disciplines to achieve synergy and produce successful outcomes. Lead QA teams in a global setting, onsite as well as offshore resource, and collaborate with the other geographically dispersed teams. 5+ years experience with vendor management, negotiating and managing large and complex technology and services contracts with both strategic sourcing partners and hardware/software vendors. Plan transition for moving the process/culture from traditional software development to test automation and continuous integration / continuous deployment (ci/cd) by using Jenkins and docker. Provide training sessions for an agile framework to internal staffs from different organizations. Play scrum master and product owner roles to transit the development and QA teams to agile practice. Work with product owners and stakeholders to adjust the priorities among 20+ projects simultaneously and follow up with project estimation, schedule, and resource arrangement and release deployments. Establish quality assurance (qa) process, release manage, production issue escalation process (incident management), and severity level agreement (sla). Oversee performance and load testing scripts and discuss the details and improvements with automation QA staffs. 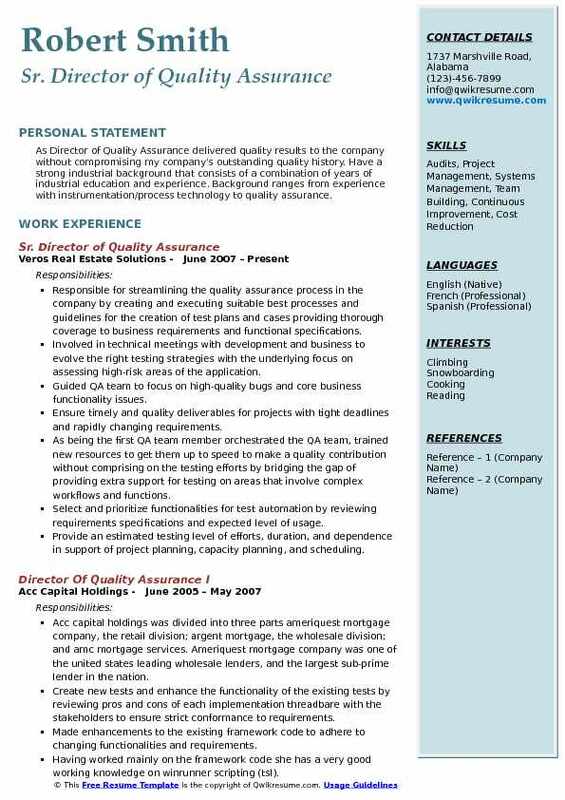 Headline : Analytical and results-driven quality leader with 5+ years of experience seeking to apply and expand my knowledge and leadership of software testing/quality assurance and product management. Interested in quality or product manager/director positions with a heavy emphasis on quality driven designed and released products. Skills : Results Oriented Leader With Technical Quality, Operations, And Business Understanding With Experience In The Development, Implementation, And Continuous Improvement Of Quality Systems Within A Cross Section Of Highly Regulated Consumer Products. QA Management Experience Includes; Global Operations Teams, Business Acquisitions, Supply Chain Optimization, New Product Launches, Project Management And Continuous Improvement / Process Excellence Concepts. Participate with other senior managers and leadership to establish quality strategic plans and objectives. Serve as a key stakeholder in core product grooming, planning, and design. Monitor and lead internal support and product knowledge assignments with customer care to assist clients with questions and concerns. Manage, track and reduce risk related to outstanding quality debt. Lead and manage all aspects of automation test environment selection, procurement, efficiency improvement and test architecture/planning. Implement company goals and objectives into daily operational activities. Coordinate testing activities across all of the Meridian to support rapid deployment of applications and services for both the base products and supported saas environments. Responsible for mentoring and leading all QA team resources in understanding product features, business strategies, risk analysis, and quality approaches. Direct all planning, prioritization practices, and recommending and implementing changes to methods for the QA organization. Summary : Dynamic and motivated leader with 20+ years multi-disciplinary experience building teams and programs in the technology, retail, and nonprofit sectors. Focused on operations, strategy, planning, and processes to enhance competitiveness in public and private companies with revenues ranging from $1 million to $60 million per annum. Managed and mentored a team of 15 in-house QA experts, 1 business analyst and an offshore team of two. Successfully drove software updates for short releases including, two weeks, three weeks, and monthly release schedules. 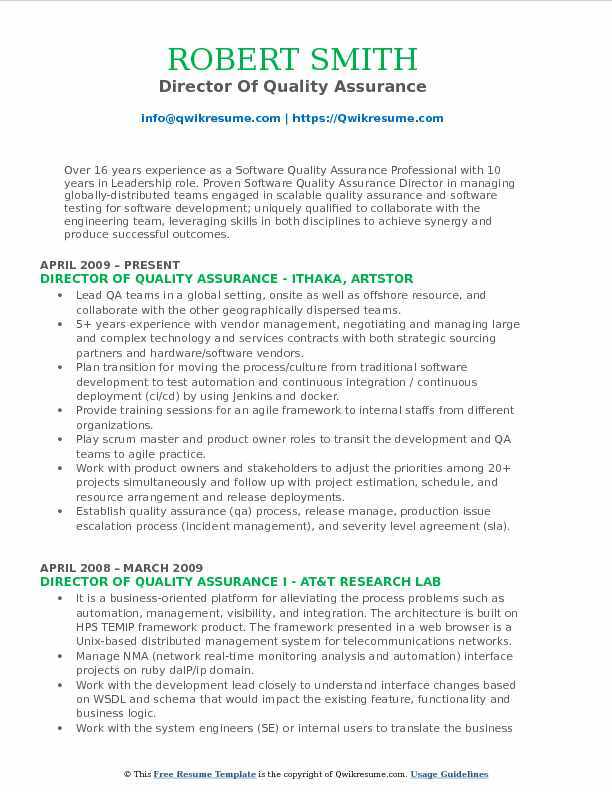 As director of QA, was heavily involved with all phases of the agile software release cycles, including participating in the go-no-go meetings with our CIO and the executive team. In addition, updated with any issues occurring within our test environments by providing them with daily status reports. Worked directly with development managers, scrum masters, and product owners to develop project schedules and resource allocation models for QA related projects and other activities such as software. Designed and implemented test plans for our different test phases. This included gathering and analyzing requirements. In addition, developed user guide documentation sets for our software products to help. Developed and managed quality assurance metrics for performance improvement to understand and improve the health of our products. Demonstrated results in managing mid-sized and large, complex systems, multi-team member development. Developed and managed quality assurance metrics for performance improvements of all teams. 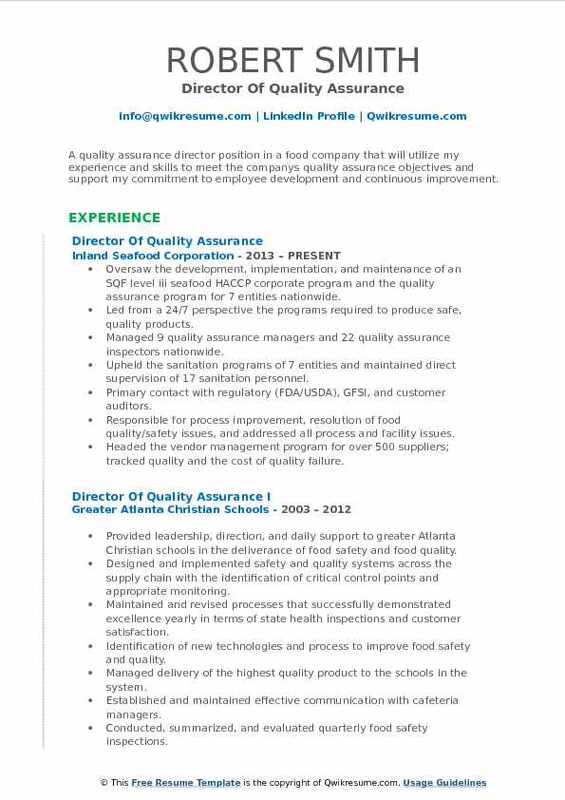 Summary : Professional Quality Assurance leader with about 9 years of experience in the food safety and quality industry. Dynamic, savvy and MS-educated who has demonstrated leadership skills in achieving budget targets while maintaining productive Quality standards. Motivated achiever who is adept at advancing the organizations objectives through program excellence, innovation, and integrity. Responsible for managing and developing the quality management programs and food safety practices for the company to assure the quality of raw materials and finished goods. Assist co-manufacturing facilities with developing and improving their quality and sanitation practices. Ensures compliance with applicable food safety regulatory requirements. Implement and manage new procedure for tracking, monitoring and reporting consumer complaints including the process for tracking consumer complaint trends. Investigating and corrective actions and calculating and obtain and maintain certifications for the company and from suppliers and co.
Identify ongoing opportunities for improvement/corrective actions and works with operations and co-manufacturing teams to implement those testing, pre-op inspections, environmental testing, torque testing, mock manufacturing facilities. Tracking of monthly defects, monthly complaint rates, quality scorecard(micro, recall, market actions, % in improvement up to greater than 90% in %ATP first pass, 100% in specs on finished product testing with 0 market actions and 0 recalls). Provides supervision and direction to plant quality assurance teams and recommend best practices. Commercialize new products and changes to existing products. Led company to earn the Hilliker platinum award for GMP / food safety systems audit.